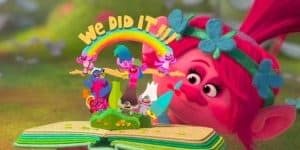 Trolls 2 To Come Out In April 2020 | Nerd Much? The sequel you never wanted is coming out just for the little ones out there, as Trolls 2 (as yet untitled) will hit theatres in April 2020. According to Deadline, both the voices of Anna Kendrick and Justin Timberlake will be returning to sing more sorely needed uplifting pop songs. Perhaps we’ll even get another hit song like Timberlake’s “Can’t Stop the Feeling!” which won a Best Song Oscar. Unfortunately, the director of the first Troll movie, Mike Mitchell, will not be returning. He will instead be directing the Warner Bros. The Lego Movie sequel, which is set to release February 8, 2019. Trolls 2 comes after the original’s quite profitable $339.5 million at the box office, which was based on the very old troll toys from the 60s. The plot is not much thicker than the toy’s hair, however, as two unlikely friends go on an adventure to save their Troll world from certain death and destruction. The original film isn’t exactly bad, but it is definitely more focused on the younger audience than the adults that have to watch it once a day after its release to streaming services. Will this sequel be any good? How can they extend the plot? Will be it be a love story to break our hearts? Let us know in the comments below! Check out more upcoming animated movies here.